RM1-2963 HP M712 M725 M5025 M5035MFP Fuser Drive Assembly. This is a genuine HP part. If you're hearing grinding noise coming from the fuser drive area, the drive gears are probably worn and you should replace this assembly. 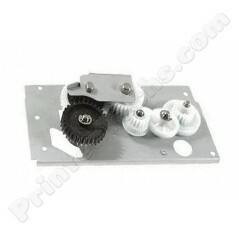 RM1-2963 HP M712 M725 M5025 M5035MFP Fuser Drive Assembly. This is a genuine HP part.